Can I insert a flash SWF file on the flipping page? The dynamic flash files will make vivid flipping catalogs. Well then how to insert a flash on the flipping digital catalog? Flip ShoppingBook Maker enables you to embed flash files on any page of your flip catalog. Just enter into the multimedia edit window. And then..
1 Start Flip ShoppingBook Maker, hit the button of Edit Shopping Cart. 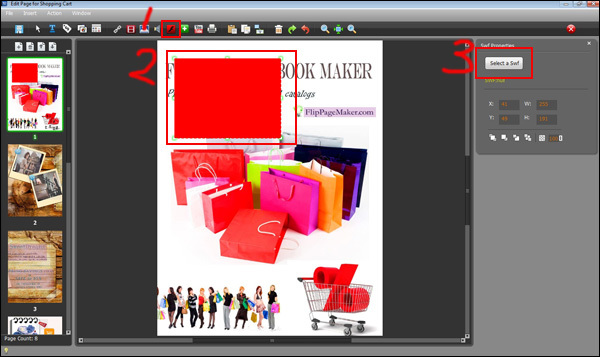 2 Hit the icon of Add SWF, and then draw an area to contain the flash file. 3 Click on the button of Select a Swf to load in a SWF format file.